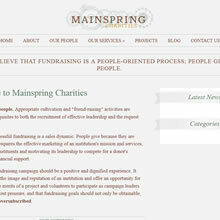 High Octane Brands | Mainspring Charities is a charitable foundation helping charities improve fundraising efforts. High Octane was approached with nothing but an idea: Develop a non-profit brand that would serve as an authoritative fundraising planning and execution solution to a broad range of organizations and fundraising planners. Establish corporate and brand identities utilizing competitive channel and consumer research to develop a positioning strategy. Develop a web site solution to serve as the corporate identity with tertiary web sites to focus on brand plasticity. Multiple web properties to allow the central brand, Mainspring Charities, to serve as an corporate informational resource, while tertiary properties would focus on individual offerings, such as PokerRun.org, to allow organizations to employ those fundraising services.